The founders of JobPharm had identified a niche gap in the recruitment market for Pharmaceutical and Biotechnology industries. This growth sector was not being adequately served by existing online recruitment media and required something more targeted as a supplement to print advertising. Generalist online recruitment websites are not sufficiently targeted and do not effectively reach the highly sought-after pool appropriately qualified and experienced applicants. This site involves a two-part registration process. Advertisers can create and manage an online advertising account, purchase advertising credits, promote jobs in specific categories and locations, modify or extend job ads. They can also track the number of people who have viewed their ads, and online applications received from JobPharm members. 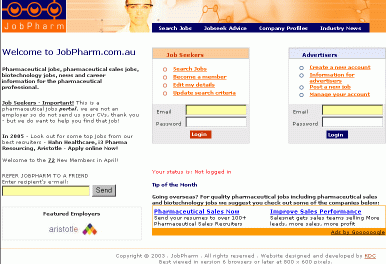 JobPharm members can set up and manage their search criteria, elect to receive regular email alerts of jobs matching those criteria, and apply online directly to the advertiser. Other member benefits include jobseeking advice specific to the Pharma/Biotech sector and a live newsfeed of industry news. A sophisticated administration site enables the business’s owners to monitor and manage advertiser and member information, as well as edit selected content on the website. This site is no longer operational.